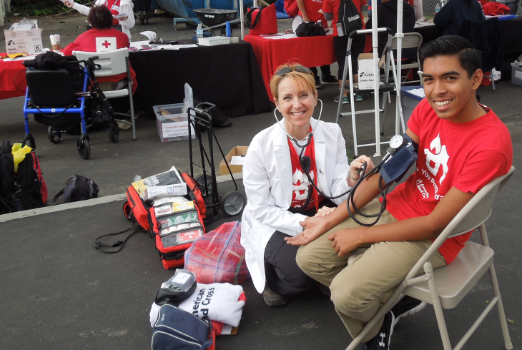 LA Talks: Tell us a little about yourself and your experience as a Red Cross Volunteer? JD: My name is Jane Dean. I emigrated from England 11 years ago. I have worked as a nurse for 31 years and currently work as a Pediatric Intensive Care Nurse, at Children’s Hospital of Orange County (CHOC). I have been a Red Cross Volunteer for almost 2 years, out of the Greater Long Beach Chapter. I volunteer in numerous capacities including Health Services, Community Outreach, D.A.T., Client Casework, Pillowcase Project, HFC, Social Media/Digital Communications and Disaster Communications (HAM radio). LA Talks: How many Home Fire Campaign Events have you volunteered with, and in what capacity? JD: I think I’ve lost count! Maybe 10-15. I usually represent Health Services for the day (in case of any injuries). I’ve also given the documentation and education trainings. I’ve even been out with an installation team, to educate families on home fire and earthquake safety! Recently, I set up a mobile radio station and acted as NET control for the HAM radio operators that were shuttling volunteers and relaying requests for supplies during the event. LA Talks: What is one of your best memories from volunteering at a Home Fire Campaign? JD: Oh I have quite a few stories, but one that really sticks out. On this particular occasion, I was educating a family that had their daughter with them. She must have been around 8-years-old. Since I’ve always had a passion for working with children, I wanted to make sure this little education session was tailored toward this young lady’s needs… and, of course, I wanted to make it fun! I asked the little girl if at school they talked about what to do in the case of an earthquake. She immediately told me they had to get under their desks. I told her that was a great answer, but I also explained that an earthquake might happen when she is not in school. That an earthquake could happen whilst she was at home, or outside playing with friends. If this were the case, I explained she would need to “drop, cover and hold on”. She looked at me with big brown eyes as if to say, “What the heck does that mean! ?” So, to make it easier we did a little role play. I showed her what we were going to do. Counted to three. Then shouted “EARTHQUAKE!” We both crouched to the ground, covered our heads and necks and stayed as low we could. When we got up, she had a huge grin on her face and jumped up on the couch with her parents, who were also very happy. This day was one of the most memorable! I think I got as much fun out of it as the little girl and her parents did! LA Talks: You mentioned you were an active digital communications volunteer. How do you think the Red Cross’ online community and digitally engaged volunteers can help prevent home fires? JD: It is said that a picture is worth a thousand words— this is so true! I’ve found that people mostly prefer to watch or see something, rather than read it. And, social media is very accessible these days and of course very popular with younger generations. Messages can be shared in an instant, and then instantly again, they can be re-shared. This spreads the word quickly. When written messages are publicized together with pictures and short videos it really draws you in. 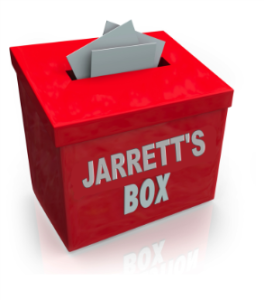 You want to see what all the hype is about! Posting photos and videos also gets the public talking. It’s kind of like a “ripple effect!” By getting the word out on social media, we can highlight the resources we have available and also, help educate the public to become better prepared for home fires. 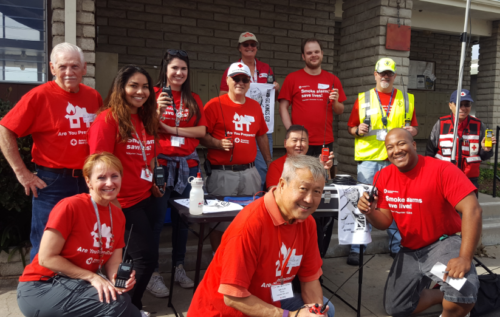 LA Talks: What is your favorite part about volunteering at Home Fire Campaign events? JD: Going out with the teams and helping to educate families (especially the children)! Having said that, there is a real “team spirit” felt at every Home Fire Campaign event. Each and every event is absolutely wonderful! We always get positive feedback from families who have received brand new smoke alarms and the “feel-good” factor sticks with me after each event. It’s just feels so good to give back!! LA Talks: Thank you so much Jane, for all you do as a Red Cross volunteer and for sharing your story with us today. JD: I can honestly say I enjoy all the ways that I am involved with the Red Cross. It’s an absolute joy to give back to my community and as a volunteer, my life is fulfilled! So thank you, for giving me this opportunity to share my story with you!